Seven young men ranging from ages 13 to 20 sat in front of a room filled with North Carolina community leaders, United Way staffers and White House officials at the United Way of Greater Greensboro to discuss ways communities can come together to help young men and boys of color become successful members of society. 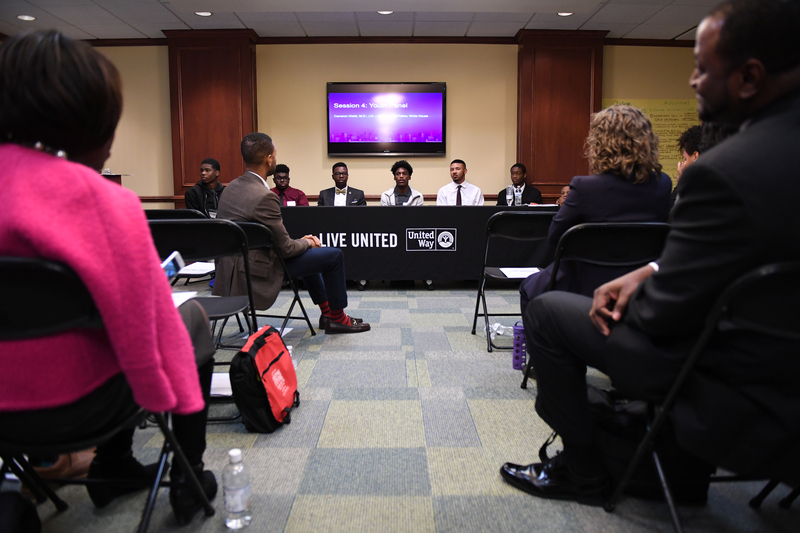 The young men spent 2 1/2 hours brainstorming ways to make their communities better, as well as assuming leadership roles to better their state before sharing their ideas with the audience. It was the first time in which members of the My Brother’s Keeper’s (MBK) 10 communities in North Carolina came together for a discussion of this sort. The group of seven students that lead the final panel of the day which they spoke about their experiences during the Summit for My BrotherÕs Keeper at the United Way of Greater Greensboro on October 10, 2016 in Greensboro, North Carolina. My Brother’s Keeper is a White House initiative created in 2014 to “address persistent opportunity gaps faced by boys and young men of color and ensure that all young people can reach their full potential.” The My Brother’s Keeper Alliance was created the following year to continue the MBK mission and create long-lasting change for young men and boys of color. 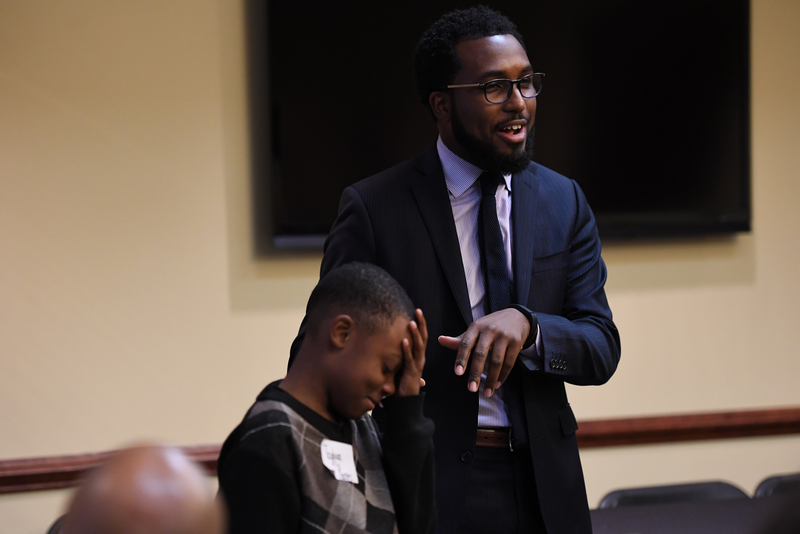 Bryant Cameron Webb, a physician and White House Fellow, is so dedicated to the initiative that he has taken a year off from his regular occupation, hoping to spark change and motivate the young men and boys who participate in the program. One of the positive outcomes of the day’s discussion is nearly all of the young men in attendance have had mentors beginning at a young age. In a surprising twist, most of the young men’s mentors were women. Although it doesn’t pose a problem, Taylor does hope to see men and women stepping up and reaching out to help young men. Jaden Aoston speaks about how at the United Way of Greater Greensboro on October 10, 2016 in Greensboro, North Carolina. Topics that seemed to hold the most weight for the young men were policing, education and mentorship. When asked if they were interested in becoming members of law enforcement, not a single hand was raised. 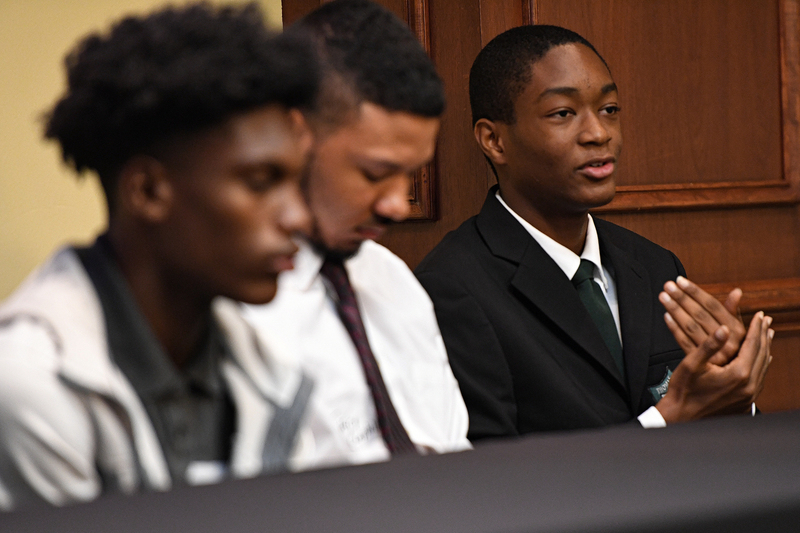 Many of the young men expressed their fear of the stigma surrounding law enforcement, which has increased dramatically in the wake of recent police-community tensions. Jeffery Campbell, a 20-year-old junior marketing major at University of North Carolina-Charlotte, described the tragic events of police brutality and gun violence that have recently occurred as eye-opening experiences. The death of Keith Lamont Scott, a 43-year-old man who was shot and killed in Charlotte last month, sparked riots that hit close to home for Campbell. The discussion surrounding police struck Taylor as a moment that MBK can use to remind the young men that change must start with them. Niiobli Armah IV puts Tayquan Barnes on the spot about his knowledge of all the presidents during the Summit for My BrotherÕs Keeper at the United Way of Greater Greensboro on October 10, 2016 in Greensboro, North Carolina. Although Taylor hopes to do much more with the program in the future, he believes panel discussions like these are a step in the right direction not only for leaders, but the young men as well.